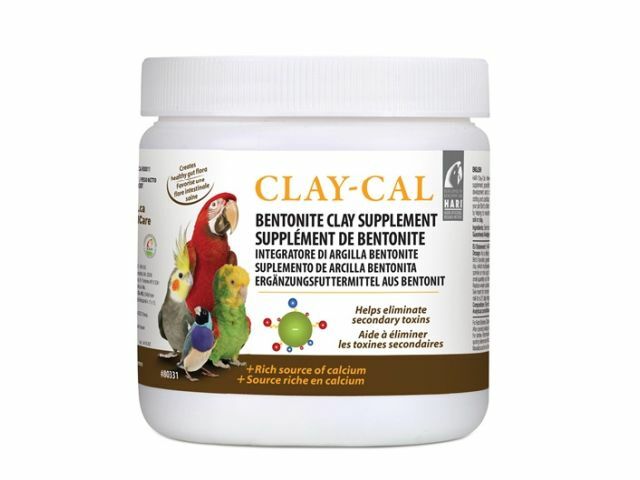 Clay Cal Bentonite Clay Supplement provieds a lot of wonderful benefits to your bird's diet by adding to a favorite moist food. It can be eaten by all birds, finches to macaws. Is derived from European Bentonite (Montmorillonite) Clay Granules, Charcoal and Calcium mixed at a healthy ratio for optimal benefit. Provides supplemental minerals that may be lacking in the routine diet. Protects the gastrointestinal tract from chemical and biological irritation and thus helps to counter gastrointestinal disease. Elevates the pH factor in the digestive system to promote good health and resist disease. Combines the detoxifying benefits of bentonite clay and charcoal with calcium. One of the primary benefits of bentonite clay, specifically montmorillonite clay which has a superior ability to absorb toxins, is its effect on countering dietary toxins by binding toxic chemicals and bacteria. Can act as an antacid protecting the gut lining from corrosion. This alone improves food intake as it protects the GI tract from chemical and biological irritation. Is for companion birds who are regularly supplied with fresh tree branches for perching, chewing and shredding activities. While the wood source is perfectly safe, some of the tannins found in the wood bark can contain secondary compounds toxins. Clay-Cal has the capacity to absorb these toxic compounds and impurities (pesticides, bacteria & fungus) found in wood, plant foods and from genetically modified ingredients, and other non-organics. Is a healthier alternative to common gravel-grit. As a daily supplement: mix or sprinkle 1 teaspoon (5 ml) of Clay-Cal onto your bird’s favorite greens, vegetables and/or fruits. Moist food helps ensure the absorption of the clay and increases the benefits of cationic activity, while at the same ensuring the likelihood that the supplement will be consumed. Alternatively, you can sprinkle or mix up to 2 teaspoons (10 ml) with extruded pellets or seeds. Replenish the supplement at least 3 times per week. Replace when soiled. It can be used as a detox: Provide a detoxifying regime for your bird we recommend the HARI Clay-Cal 21 day Clay Milk regime: With a plastic or non-metallic spoon, mix 1 teaspoon (5 ml) of HARI Clay-Cal with 125 mL (1/2 cup) of water. Let mixture settle overnight. The “mud” will sink to the bottom and a “milky” liquid know as “clay milk” will float to the top. The “clay milk” can be served to birds in a non-metallic drinking bowl for detoxification therapy. Change water daily. Repeat for 21 days. Save the “mud” for external poultices. Externally, it can be used as a poultice on injuries and will help draw toxins and infection from wounds. If the bird picks at it, it won't hurt the bird and can be reapplied. Please don't use Clay Cal as a substitue for your vet. It can iterefere with medications. Ask your vet if it can be used along with treatment. Ingredients: Bentonite (montmorillonite clay), calcium carbonate, charcoal. Guaranteed Analysis: Calcium 7.5% (min), Calcium 8.0% (max).